This post will bring you up to date with what’s going on in my life, just a little bit. I have a few other posts planned for the next few days as well. 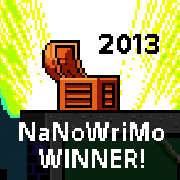 As you can see above, I won NaNoWriMo! This is my first year to officially win, and it was awesome. I managed 50,138 words (the validation said 50,037) in the month, making it just barely past the goal for the month. But I made it. There were hard days, and there were… Not so hard days. I wouldn’t say that any of them were easy days, but that’s fine. I feel a sense of accomplishment. Winning NaNoWriMo has been something I’ve wanted to do for years. This year, I decided to finally do it… and I did! It’s nice to know that when I set my mind to something, I really can get it done. With all of the rest of the insanity that is my life. One of the main reasons that some of the days were hard (And I only managed to write 600 words on a few of them) was school. I’m a full time Math and Computer Science double major, taking 12 hours this semester. In the middle of November, I had exams in all of my classes. That week, things really slowed down for me. After that, just when I was almost caught up again, I hit a rough spot in my writing. I still don’t know exactly what caused it, or how to fix it (I’m saving that for revisions), but it slowed me down as well. I ended up writing over 10,000 words the last 4 days of the month to finish on time. The novel isn’t anywhere near complete, which makes me incredibly happy. I’ve always wanted to write long. I want to write books like my heroes do, and those are people such as Brandon Sanderson, Robert Jordan, and George R. R. Martin. The highlight of my month was definitely going to a midnight release showing of Catching Fire. That movie was perfect. I’m still not sure exactly how they made it so awesome, but I loved it. All of the returning characters were just right (Haymitch’s glass raising during the Interviews drew a round of applause from the audience. Effie breaking down during the reaping was powerful), and the new characters were, if anything, even better (Johanna Mason. PERFECT.). I know I sound like a bit of a fanboy, and I’m not sorry. I love those books–and re-read them right before seeing the movie–and seeing a movie that I felt did justice to the book was awesome. 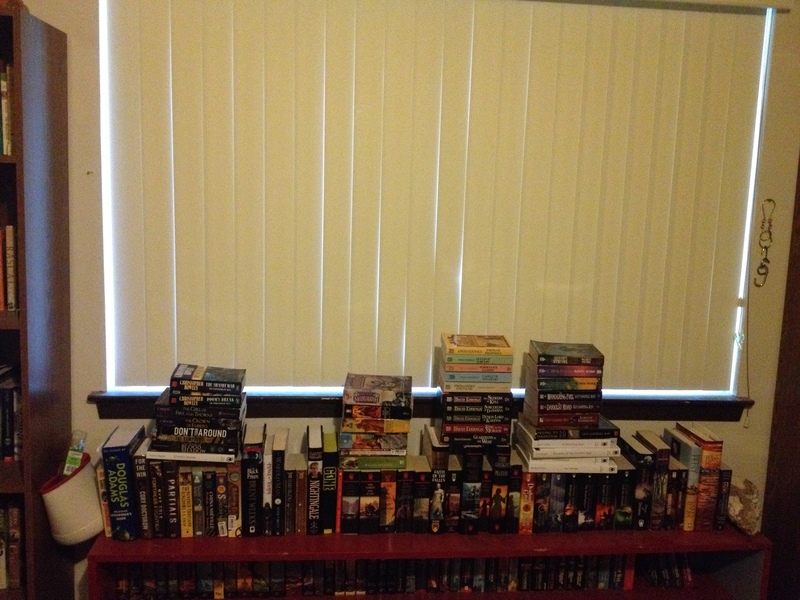 I have managed to acquire, um… Far too many books. And yet, never enough. All I can say is that I love books. All of the books on the top shelf–I haven’t read any of them yet. I started keeping a spreadsheet of my reading habits (found here), and by any measure, books I buy now won’t be read until 2015. And I still have 44 on my Amazon wish-list, and more than that at the bottom of that spreadsheet. (And more that I haven’t listed yet that I’ll try to get anyway.) Yeah… I’m a bit addicted, I think. But I LOVE BIG BOOKS, AND I CANNOT LIE. So there. The next two weeks are going to be my last week of classes, and then my finals week. I’m feeling pretty confident going in, so hopefully I’m not just completely lost and hopeless. I’ll be back tomorrow to tell you about an awesome book I read that comes out next month. Until then, happy holidays!